The passage we will read is a chapter from the book about the people of New York City trying to get back to work after one of the most destructive blizzards in history that struck the eastern United States from Virginia to Maine on March 12, 1888. The chapter focuses on how a few ambitious people get folks to cross the frozen East River and make money while doing it. It is also quite descriptive as to what people witness as the tide of New York Harbor starts to shift and what happens when disaster strikes. Design a way for people to cross the river safely. What equipment was available? Design clothes for either a man or women to keep them warm. What would you design to predict the storm was coming. How did they get their information? Design a transportation system for this time period for people to et to work. How did people usually get to work? BLIZZARD! By Jim Murphy is part of a fifth grade Houghton Mifflin Series. Students will write a weather report about a fictional blizzard. They will include details about what will happen (using meteorological terms) and how people can stay safe. Students can then choose a way to present it, orally, put on a skit or video tape and view their forecast. Have students design an instrument to measure snow in inches and centimeters. Once class agrees on a design they will need to make it and mount it outside. They will then collect data similar to how they did weekly monitoring of the rain gauge. 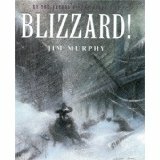 Acclaimed historian Murphy shows how a devastating 1888 blizzard not only shut down our northeastern states for days, but radically altered the way Americans live; its repercussions are being felt even today. He illustrates how political corruption, ineptitude, and contemporary social attitudes exacerbated the storm's fallout. Using carefully chosen excerpts from survivors' personal accounts, he also gives us a vivid feel for what life was like then for immigrants, women moving into the workplace, and others who had to struggle to survive everyday. He employs an interesting mix of graphics to further illustrate his story. Junior high school students who believe history is boring may think differently after reading this; it should also appeal to readers interested in natural disasters, and in social histories. Here's another winner from the author whose "The Great Fire" brought Chicago's infamous conflagration so brilliantly to life.